Morvan's syndrome is an autoimmune neurological disorder characterized clinically by neuromyotonia and neuropsychiatric manifestations along with laboratory evidence of anti-voltage-gated potassium channel (VGKC) antibodies. Despite a characteristic clinical and laboratory picture, it is frequently misdiagnosed and not commonly reported. We report a case of Morvan's syndrome that was diagnosed only after 6 months of disease onset. A 60-year old gentleman presented to our tertiary care hospital with a 6-month history of episodic confusional state, paresthesias of all four limbs, and significant weight loss. During the episodes, he developed confusion, disorientation to person (inability to recognize family members), disorientation to time (brushing at 3AM in morning) and place, aggression (needed to be restrained), along with bowel and bladder incontinence. He was evaluated elsewhere found to have hyponatremia (serum Na: 118–122 mEq/L) during the episodes. Initially, the episodes used to improve following correction of hyponatremia. However, during the last episode, alteration in behaviour persisted despite correction of hyponatremia and he was referred to our hospital. On examination, he was emaciated with generalized wasting; he had lost 24 kg in the last 6 months. He was disoriented and confused with a MMSE (mini-mental status examination) score of 16/30. He was inattentive and agitated with prominent visual hallucinations. Rest of the higher mental examination was not possible. Motor system examination revealed generalized continuous muscle activity with fasciculations in the tongue, chest, arms, and legs. There were no other focal neurological deficits. Deep tendon reflexes were brisk and plantar responses were flexor. In view of the combination of neuromyotonia, sensory symptoms, hyponatraemia, and altered mentation, a possibility of Morvan's syndrome was considered and he was evaluated. Hemoglobin, total and differential leucocyte counts, liver, renal, and thyroid function tests, serum and urine electrophoresis, serum antinuclear and antineutrophilic cytoplasmic antibodies, serum calcium and phosphorus, as well as serum sodium and potassium were normal. Cerebrospinal fluid (CSF) analysis showed a protein level of 41mg/dl, sugar level of 60mg/dl, and no cells. Electromyography (EMG) of the right quadriceps and paraspinal muscles showed continuous muscle fiber activity, whereas the routine nerve conduction studies were normal. 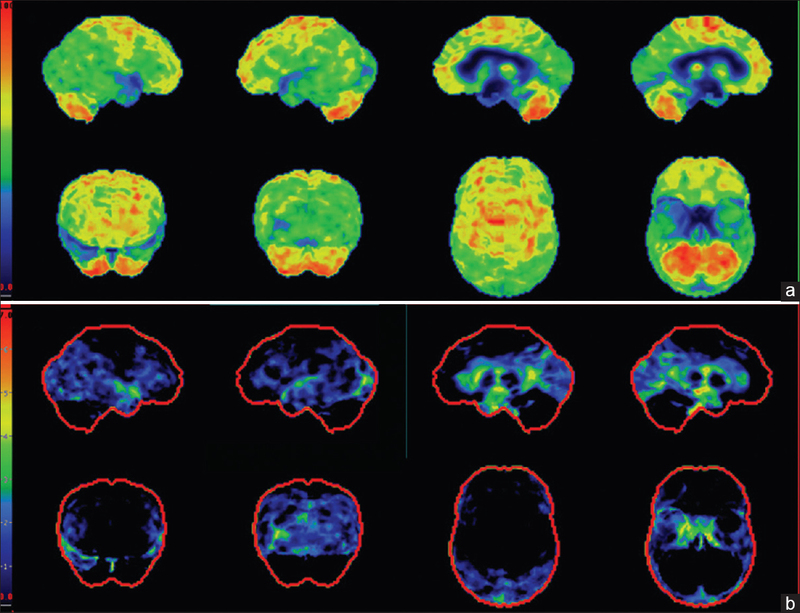 Magnetic resonance imaging (MRI) of the brain was unremarkable, and fluorodeoxyglucose positron emission tomography (FDG-PET) revealed hypometabolism in bilateral temporo-parieto-occipital and right inferior frontal cortices [Figure 1]. Serum and CSF VGKC (CASPR2: Contactin associated protein like 2) antibodies were positive. He was given a course of intravenous immunoglobulin at a dose of 1 gram over 5 days, following which he completely improved and was discharged. However, he came back after 1 month with altered sensorium at which time he was treated with rituximab, with which he improved and was doing well (MMSE-30; no neuromyotonia) at the 8-month follow-up visit. A repeat positron emission tomographic (PET) scan revealed significant normalization of the hypometabolic activity [Figure 2]. Rituximab pulses at 6 monthly intervals have been planned. There have been very few case series of Morvan's syndrome from India. 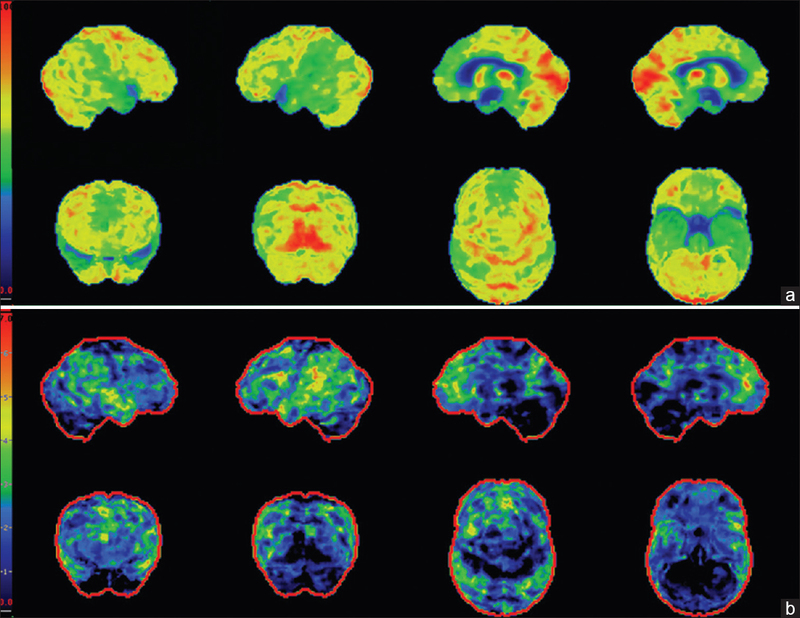 Pandit et al., in 2013, reported on 15 patients suffering from autoimmune encephalitis. Anti-VGKC antibodies accounted for 5 (36%) of the patients in their series. All their patients had seizures and neuropsychiatric abnormalities. However, they did not comment on the presence of muscle hyperexcitability. None of the patients showed any evidence of malignancy. MRI was abnormal in all the cases compared to our case in which it was normal. All their patients responded well to immunomodulation. In another series by Kamble et al., out of 16 patients with autoimmune encephalitis, 2 had anti-VGKC antibody positivity. Both the patients had episodic irrelevant talking, irritability, confusion, memory impairment, and seizures. Hyponatraemia was seen in one patient. MRI brain was abnormal in both the patients. They also did not comment on the presence of continuous muscle fiber activity. Despite an unmistakable clinical picture, patients with Morvan's syndrome are often not diagnosed early, mainly due to lack of knowledge regarding this disease. Even in our patient, it took approximately 6 months before he could be diagnosed and given proper treatment. This is unacceptable as most of the patients respond well to immunotherapy in the form of intravenous methylprednisone, intravenous immunoglobulin, plasma exchange, and cyclophosphamide or rituximab. Our patient responded well to immunotherapy and was doing well at the 6-month follow-up visit. To conclude, Morvan's syndrome should be considered in every patient who presents in a confusional state along with evidence of peripheral nervous system hyperexcitability. Appropriate immunological tests should be conducted to confirm the diagnosis. Once diagnosed, patients should be given immunotherapy for ensuring a rapid recovery. Liguori R, Vincent A, Clover L, Avoni P, Plazzi G, Cortelli P, et al. Morvan's syndrome: Peripheral and central nervous system and cardiac involvement with antibodies to voltage-gated potassium channels. Brain 2001;124:2417-23. Hart IK, Waters C, Vincent A, Newland C, Beeson D, Pongs O, et al. Autoantibodies detected to expressed K+ channels are implicated in neuromyotonia. Ann Neurol 1997;41:238-46. Kleopa KA. Autoimmune channelopathies of the nervous system. Curr Neuropharmacol 2011;9:458-67. Serratrice G, Serratrice J. Continuous muscle fiber activity, Morvan syndrome and limbic encephalitis: Ionic or non-ionic disorders. Acta Myol 2011;30:32-3. Pandit AK, Ihtisham K, Garg A, Gulati S, Padma MV, Tripathi M. Autoimmune encephalitis: A potential reversible cause of status epilepticus, epilepsy, and cognitive decline. Ann Indian Acad Neurol 2013;16:577-84. Kamble N, Netravathi M, Saini J, Mahadevan A, Yadav R, Nalini A, et al. Clinical and imaging characteristics of 16 patients with autoimmune neuronal synaptic encephalitis. Neurol India 2015;63:687-96. Misawa T, Mizusawa H. Anti-VGKC antibody-associated limbic encephalitis/Morvan syndrome. Brain Nerve 2010;62:339-45.